Pastries in India are one of the lovely consequences of the British colonialism. To date, I do believe that the average bakery in India makes fluffier, softer and divine-r cakes than most here in the US. I have come to realize it has something to do with the texture of the flour, as much as, the amount of sugar and sweeteners added. The fineness of the flour is crucial for a soft cake. Despite the fact that the AP flour here feel well ground, when you compare with the 00 European grind of the average maida (AP flour as it is called in India), you can feel the difference when you rub them between your fingers. Maida is almost starchy in texture even though it is made from the same kernel. Perhaps the wheat is different? This difference I have also seen in whole wheat flour. American whole wheat is a lot coarser than the similar we use that goes by "Atta" and used to make rotis and other non-yeast flat breads. Perhaps the mills are different? I have yet to actually bake with maida or atta, although after this musing, I think that's next on the list... just as soon as I get to the Indian store. My point of that starting ramble was to introduce the cake for today, which, is made with a much coarser flour, corn, and yet delivers a wonderful crumb. Because, this cake is all about crumbs rather than sponginess. 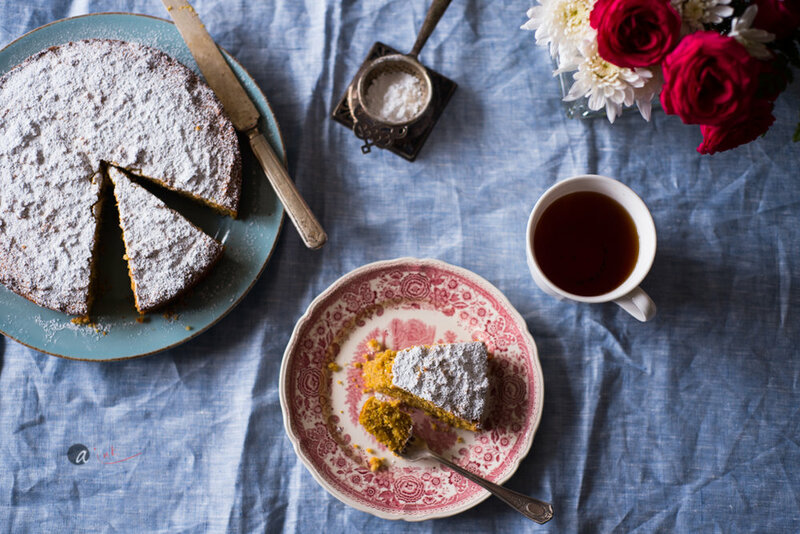 This cake is made using one of those Italian staples, Polenta. Their particular version of this yellow corn flour is extraordinarily finely ground, with more of a nut meal like texture than the grits we easily find in the States. This is what lends the corn flour to their delightful use in pastries. And, you can imagine it is much cheaper than fine ground flour. After all, polenta is an everyday savory staple and its use in sweet creations is an accessible extension, especially in the heartland of Tuscany that while beautiful is a harsh agrarian land! I actually did not have the fine ground Italian polenta on hand. So, I improvised using yellow grits that I blasted through the Vitamix to make a super fine flour. If you go to an Italian store, look for 'fine polenta'. Also, this is the version, best suited for the eponymous dish as the Italian corn flour has a superior flavor the American flours. A close substitute would be Mexican/South American/Arepa flour. Wash/scrub the orange thoroughly, place it in a saucepan and cover it with cold water. Set it over a medium heat and bring to the boil. Simmer for about one hour, or until the citrus is tender all the way through. Stick a toothpick to test doneness. It should easily go through. Drain and purée flesh and skin in a blender until smooth. Preheat the oven to 375F and butter and prep a 8 inch cake mold. In a large bowl, whisk the eggs with the sugar until airy and pale yellow (about 7 minutes). Add the puréed fruit and fold through. In a separate bowl, combine the dry ingredients. Fold the butter and work it into the dry mix to get a mealy texture. Add the wet to the dry and fold to combine. Pour the batter into the prepared cake tin and level the surface. Bake for 40 minutes, or until a skewer comes out clean. Remove the cake and let it to cool in the pan for about 20 minutes. Transfer it to a rack to cool completely. Dust the surface with powdered sugar before serving. A FLORENTINE TALL DARK AND NOBLE!